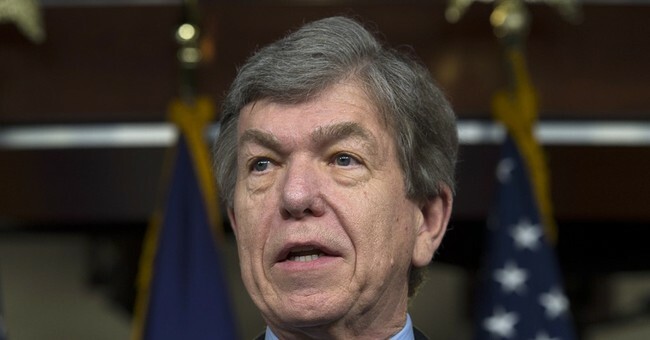 Sen. Roy Blunt (R-MO) joked alongside GOP Senate leadership Tuesday about the Democrats’ Green New Deal resolution to combat climate change. Senate Majority Leader Mitch McConnell (R-KY) held a vote on the ambitious proposal Tuesday and Democrats voted "present" on the resolution despite backing it. Senate Minority Leader Chuck Schumer (D-NY) called the Senate vote on moving the resolution forward a "sham vote," while McConnell argued that he would like to get Democrats on the record on the proposal that all the 2020 Democratic presidential hopefuls in the Senate have backed. Additionally, the proposal comes with a hefty price tag. One study estimated the resolution would cost $93 trillion over ten years. "Climate change is not a joke," Sen. Ed Markey (D-MA), a co-sponsor of the Green New Deal, commented Tuesday. "Mocking it and comparing it to cartoon characters while the Midwest is flooded and people have died because of climate-related extreme weather is shameful." Markey was likely referencing some of the floor speeches given by Senate Republicans, including one by Sen. Mike Lee (R-UT) that mentioned cartoon characters. The Senate ultimately rejected the proposal Tuesday afternoon after Democrats voted "present" to protest the "stunt" vote.